http://www.flickr.com/photos/8810371@N02/ is the link ... so check it out! 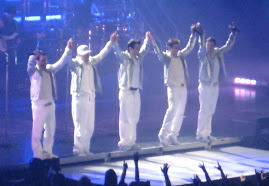 Of course, the NKOTB pics were not taken with the new picture :) Hope that you enjoy! Are done for a little while. Next is my birthday but I doubt we will be doing much -- other than perhaps going out for supper that night (since it's a Monday) .. the kids are out of school that day - not sure why ... but oh well! :) We'll see what happens. Jason is looking at vacation time for this year .. not sure when he will take some -- and what we will do. Definitely want to do things with the kids .. something educational but fun! Of course, there is one other thing that I want to do -- but will have to wait and see how things go for that. Our first for spring break is possibly going to Washington DC ... lots of museums .. lots of walking! LOL .. so, again, we will see what happens! He is going to request times off today ... and we'll go from there. Anyway, I guess that will be all for now. Hope that all is well with you (who is reading this) .... be blessed! !